Update: We received comment from an Epic Games spokesperson who told us "We had a configuration issue and it has now been corrected." Regardless of the fact that the feature appears to now be corrected and the feature is no longer accessible, we've now seen just how possible cross-platform play between PlayStation and Xbox is. When asked by a fan on Twitter what he thought of the configuration error, Xbox's Phil Spencer replied that he would have been happy for the feature to be left switched on. And they said it couldn’t be done. Actually, maybe it’s more of a case of wouldn’t be done. 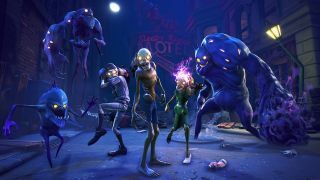 Regardless, players of Epic Games’ cooperative survival game, Fortnite, are reporting that cross-platform play between PlayStation 4 and Xbox One has been switched on. Taking to Reddit, Fortnite players have posted screenshots of their gameplay which appear to show Xbox gamertags appearing in matches being played on PlayStation 4 consoles. Redditor PRE_-CISION-_ was the first to post an image of an Xbox gamertag appearing in his game and naturally the entire community started digging into the matter. It appears that the player was indeed an Xbox user and that they were playing on an Xbox console, not a PC, meaning it really does appear cross-platform play was happening. Shortly after, more images appeared on the page with one father and son duo even posting an image of them playing side by side on Xbox and PlayStation consoles. Considering the current stance on cross-platform play between Xbox and PlayStation is that it’s absolutely not happening, this is a surprising development. This isn’t because such a feature would be impossible to implement, but rather because Sony appears to have no interest in it. Only recently Rocket League cross-platform play was switched on between Xbox One, PC and Nintendo Switch while Sony’s PlayStation remained notably absent from the lineup. Microsoft did, however, say only a month ago that it's currently in talks with Sony over the feature. “In any circle of friends there’s going to be PlayStation, Xbox and PC users and all of these platforms would benefit greatly from being open and enabling all of these different gamers to play with their friends,” he said, “I’d love to see some diplomacy. Nations have diplomacy, so maybe console makers could have diplomacy too. Considering Epic’s CEO is such a firm believer in the benefits cross-platform play would bring to multiplayer titles it’d be apt that his company’s game was first to test the feature out. We’ve reached out to Epic Games to ask for comment on these reports and whether or not the feature is deliberate and will update here with any official response.